My kids wanted to bring one of the puppies home, they begged me to but I hardened my heart and said a firm ‘No’. My daughter, Shloka, was the instigator and young, Kartik, went along with his elder Didi. They tried to wear my defenses down but I stayed unrelenting and firm on my decision to keep our house dog-free. I was terrified of dogs, even small puppies. This story from my childhood days will convince you of my fear; I am not proud of my actions back then. I was about 10 years old, terrified of dogs, when my dad’s brother and his family came to stay with us for a couple of months. My uncle had three children; the youngest girl was 3 at the time and was very attached to me. Back then Mumbai was called Bombay and it wasn’t as crowded and congested as it is today, also we were lucky enough to live in the most beautiful and charming place in Mumbai, right next to the Arabian Sea, in Colaba, Bombay. I was born here and lived in this paradise for 18 long years; these were the happiest years of my life. 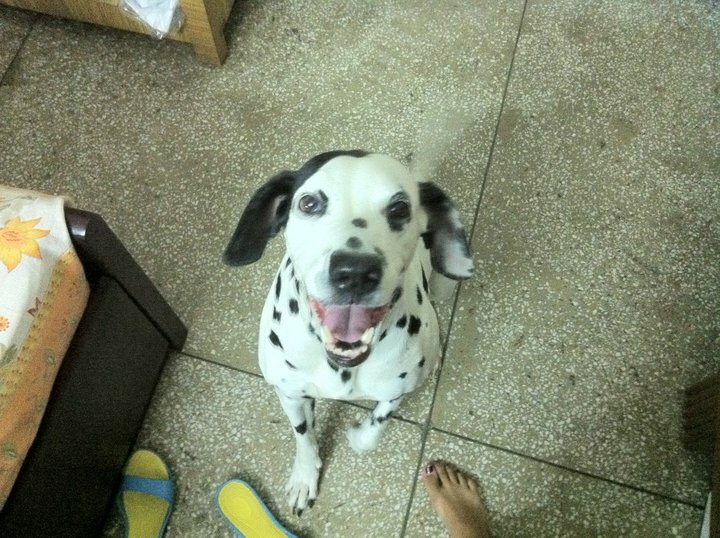 One day we were playing in our building’s compound when a vicious dog, (he looked scary) cornered us. I froze with fear and did the unthinkable, pushed my little cousin towards the dog as if offering her as his meal and ran up the stairs to my house. She managed to survive being eaten by the dog and came home crying, accusing me of abandoning her so heartlessly. My aunt was shocked at my behavior and so were my parents, it’s been 40 years now but my family members still bring up that incident at our every get-together and have a hearty laugh at my expense. How could I think of bringing a dog home? I gave my kids the ultimatum, the dog or me. To my relief, they chose me, I should have guessed they were up to something but I was so relieved at their largesse that I let my guard down. The little monsters had a sneaky plan and I was the patsy, I just didn’t know it yet. Ha ha Sulekha.. desperation makes one do strange things. Waiting for Sparky to get home. Tulika, It does 🙂 She will be home soon. Oh, I understand the fear of dogs. While growing up, whenever I saw a dog I changed my direction and picked up my pace. My friends would tease me endlessly about my irrational fear. Shanaya, I did the same too 🙂 Sparky is the only one I don’t fear. Oh boy! That incident from your childhood must be terrible. I remember how the three of us pestered our parents to get a dog. They were not scared but didn’t want the added responsibility. You are from Bombay too? I spent my growing up years there. I lived in South Bombay too — Breach Candy, Napean Sea Road. Those were the days! Rachna, I love Bombay 🙂 Where did you go to College? I was in Jaihind and later Mithibai. My parents loved dogs and had brought home a Dachshund pup but all four of us(siblings) were terrified. Swathi, it is so bugging when they bring this incident up 🙂 Sparky made me brave. I want to know what happened next..Good one Sulekha! Oh my you really must’ve had a great fear of dogs. I can imagine as my cousins had a dog and I was petrified of him. And dogs sense fear! Suzy, dogs do sense fear but once you let them know you mean no harm then they shower you with love. ha, ha, ha how much you were pertrfied! The fear lingers on. Kids have a sneaky way of convincing parents. I remember pestering my mom for a rabbit… but no she was adamant. My husband had a pet rabbit but the rabbit was very destructive. He chewed through his blanket, slippers, jeans… Dogs are the best. At 10 years, which is my younger son’s age, I can imagine how you must have been scared to death and acted on self-preservation without even thinking. And such things remain with us for life. Hopefully, there is a happy ending to this one.. Kids are like that. Even me and my brother did that to my mom and it is the mom who ends up getting most attached to the pet. oh boy!..Such incidents are what makes us who we are!.. Vinitha, welcome to the list of my tormentors 🙂 Every child deserves a pet, get him one. I’m interested to find out how you got over this fear of dogs. That incident with your cousin was a reflex and I’m glad she survived. It was only after Sparky came into my life that I became brave enough to pet other dogs. Shalini, I can’t look her in the eye even today 🙂 My daughter and son are all grown up and working and studying. Sparky remains close to their hearts, especially for my son who is in Canada. How could you resist Sparky? Corinee, thanks a ton 🙂 I was more scared than anything else.